"Karma" is a word that comes from Sanskrit, the ancient Indù language, and it literally means "Action". Briefly, we should try to understand the law of cause and effect so to avoid its negative effects, improving our way of thinking and living. We may think to the Karma as a law that makes us face always the same problem until, through our actions, we have not solved it. To live our own Karma is nothing more than a consequence of what we have done before. (for whatsoever a man soweth, that shall he also reap). The integrated amplifier PA-40 Reference is, in fact, a remarkable step above with respect to the also excellent recent production (PA-30 and PA-100). Aesthetically, the improvement is evident, and we can finally assert that this is a gorgeous amplifier to look at, and though massive and "clean", it doesn't lack a touch of excellent and luxurious finish. The intriguing blue backlit Plexiglas "window" displays the logo of the producer and indicates the operative status of the unit, operative status which is then remarked by two small LEDs: green if the amp is working in "A" class A at 50%, red if in pure Class A at 100%. 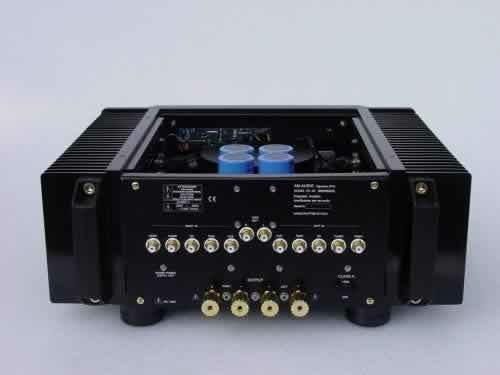 For this last born, AM-Audio claims a 40W per channel output power, in pure class "A" @ 8 ohm. 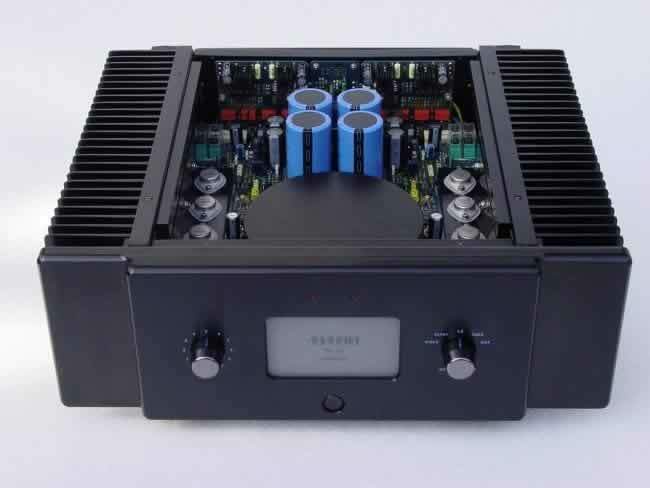 Knowing the conservative attitude of AM Audio, I consider this rated power to be very far from the truth and I woulnd't be surprised to find 20 extra watts per channel. Such value of power tends to double halving the applied load, confirming the excellent "power generator" tradition of the AM Audio power stages. Actually, the main novelty of this integrated amp, with respect to the previous models, is the presence of a real active preamp section, in lieu of the totally passive one used before (the inputs were directly connected to the volume pot). This, in real world, translates into a far better electrical interface with the sources, and the guarantee that the power stage will always be driven correctly and adequately. Looking inside the amplifier, we meet the usual (for this Company) king-sized heat sinks, given that class "A" does produce a lot of heat and needs wide surfaces to dissipate it (in this case the total heat sink area is about 1.2 sqm!!!). I smile at the idea of all those amplifiers that, while claimed to work in class "A", make use of diminutive internal heatsinks, producing only a fraction of the impressive heat this PA 40 generates while on. The rear panel has 5 line inputs, a couple of switches to select class "A" mode (full or half), a tape loop and the usual (enormous) speakers output binding posts. We should also remark that before tape output, there is a true buffering circuit made by means of class "A" mosfets, that is to say a real insulation circuit, extremely useful in the case the amplifier is connected to a tape recorder that lacks such a circuit. In this unlikely situation an integrated amplifier (or a preamplifier) without "buffer", would find an anomal load on the signal, building up distortion and hence worsening the sound. The internal view of the AM Audio products, for beauty and richness of the components used inside, starts to be nicely annoying :-) The amp seems over-engineered and over-built, everything seems perfect, and it's almost irritating not to find any minimal fault (like chaotic wiring, a messed up component etc..). 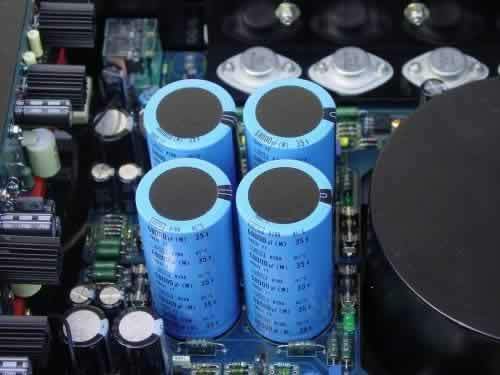 It is impossible, then, not to notice the enormous 500 VA toroidal transfomer, fully armored and resinated, with a double secondary, the four double MOS-FET pairs (every container accommodates, in fact, two parallel units, and there are two pairs for each channel), and the enormous filtering capacity (over 500.000 µF (not a typo)!). We should also notice that in the PA-40 Reference there is no Out/In (simply defined "total") negative feedback applied, and the single local feedback is limited to the insignificant value of 3,5 dB in the preamplification stage as is in the power one (!). The quality of the components has been chosen among the best available on the market, to guarantee a stableness in time of musical performances, so to avoid that the component changes its way to sound after a couple of years or more. Dimensions 44 x 17,5 x 44 cm (L x H x D) (yes, it's BIG! ), 28 Kg (60 lbs, yes it's HEAVY!) of total weight. For the happiness of the laziest audiophile out there this unit has a motorized remote controlled volume, with automatic zeroing (that can be excluded) when switching power on. Following the tradition of the Italian Company the warranty is extended for a five years period. The usual AM Audio family sound is not betrayed by this new amplifier: clarity, correct tonal balance, accuracy, energy, refinement, neutrality, transparency are the atouts that emerge after a first quick listening. Attilio Conti's tends to design amplifiers that do everything in order not to let perceive their presence into the HiFi system and it seems this way of thinking has been successfully applied once again to this PA 40. However, in the PA-40 Reference sound there is something different with respect to its ancestors, something new that I don't remember to have ever noticed in the previous production, if not, perhaps, listening to the 04-N preamp and A-50 Reference pure Class A power amp. The PA-40 Reference sounds, actually, in an extremely sweet and delicate way and manages the musical signal with an unusual velvet touch, even if in a determined and authoritative context as it is reasonable to hear from a solid state product of this class. We are not speaking of euphony, because there are no perceived traces of artificial musical patterns that try to modify the harmonic content, in favour of certain portions of the audio spectrum: the bass is there, solid, extended and powerful, well supported by an agile midbass with no "overhang" of sort. Beautiful is the mid range, sweet and delicate though precise and very present. It excellently melts with the mid-high range and is never shouty or edgy. The high range appears to be airy and refined. While listening to the PA-40 Reference, one gets the impression of a remarkable underlining smoothness, that however does not decrease or affect the dynamic performance. In the dynamic department, actually, the PA 40 simply shines both in terms of pure, sheer energy and speed, though remaining natural and accurate. Dare I say it.....a musical character like a tube amp? I'm not 100% sure since I've heard both good and bad sounding tube amps. So I'd better say that the PA 40 does have the best qualities of the "good sounding" tube amps, with that extra energy "kick" and bass control that only massive, class A amplifiers can guarantee. The creation of the virtual image is hard to criticize and turns out to be wide and focused in all the three spatial dimensions, giving way to the listener to easily read the architectures of the sound and of the different musical compositions. Even in this case it seems the whole "picture" has been privileged rather than the one of the single elements. The interpretation seems to elude the artificial chiaroscuro's, instead underlining the solidity of the whole stage. This "solid" 3D stage is obtained without sacrifying the focus and the precision of the contours and since these aspects seem to be mutually exclusive, I'm quite surprised to find both in the same amp. AM Audio has probably decided to give to PA-40 Reference a more "universal" musical character, with respct to their previous production. They made it their way, keeping total quality at high levels, with that touch of sweetness and delicateness that several users tend to prefer, as it makes an HiFi system always pleasant to listen to, even for many, many hours. On the other hand, this sweetness does not cut anything away from the musical performance and you can be sure that precision and detail are never lacking with the PA 40. The choice to put the IEC mains socket at the bottom of the unit (!! ), near the power supply transformer, has been taken to avoid the presence of the mains cable inside the chassis, so as to limit possible interferences with the delicate preamplification circuits. A clear technical choice, but this limits the possibility to use "special" mains cables, generally stiff, huge and equipped with a straight IEC plug (the mains cable supplied with the amp uses a L-shaped connector). Of course, one can use adapter (not recommended) or insert big feet or spikes under the unit so to have enough room for a straight IEC plug. A solid and stiff shelf (considering the weight of the unit), that does not limit air circulation around (and over) the component (heat buildup) is strongly recommended. Anyway, as any other class A AM-Audio amplifier, a thermal protection is supplied so overheating is never a serious threat. An essential thing to do to get the best performance is pre-heating (warm-up), because when cold the amplifier is very far from expressing its own musical qualities. This is common practice with pure Class A power amps. If you have good efficiency speakers, or if your listening level is "reasonable", and very rarely you push your amplification to the limit, the option to halve the class "A" power output will let you fully enjoy its musical performance while limiting heat buildup and, consequentially, saving energy. With the PA-40 Reference AM Audio offers an amplifier which tries to represent the "point of contact" between "tube amps" lovers and solid state nuts. The PA-40 Reference will not be the amplifier that will bring an audiophile to its own "Audiophile Nirvana", but among the evolution process of the AM Audio integrated amplifiers, it represents, with no doubt, an important and remarkable step forward. Seriously recommended.